SUBWAY® stores make the perfect choice for those looking for tasty, convenient food to fit around their shopping experience. We have a wide range of fresh and healthy options all offering great value, which means there really is something for all the family. 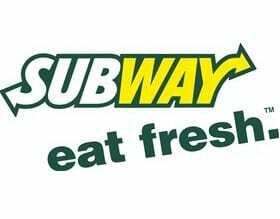 Whether it’s our delicious range of Low Fat Subs, flatbreads and salads, our SUBWAY LUNCH™ at just £3 or our brand new KIDS’ PAK™ why not come in and take advantage of what the SUBWAY® brand has to offer and enjoy your Sub your way!